CARSON CITY, Nev. (AP) - Nevada political observers say Democratic leadership wanted to avoid a divisive and hot-button debate this session over the death penalty. It's an issue they say moderate Democrats have a hard time fully embracing in a state with a history of law-and-order politics. And what each of them mean. The Department of Housing and Urban Development is moving to bar undocumented immigrants from receiving housing aid, saying it is acting on behalf of the millions of American citizens and legal residents who are waiting for public housing. HUD is already prohibited from providing financial assistance to unlawful residents under a law enacted in 1980. But a proposed rule that the agency sent to Congress on Wednesday night would eliminate what it says is a regulatory loophole that allows people to live in subsidized housing without having their immigration status checked. Under the proposal, all HUD-assisted residents under the age of 62 would be screened through a Department of Homeland Security program called the Systematic Alien Verification for Entitlements. People wouldn’t have to move out of public housing or lose their rental vouchers right away: Households that include unlawful residents would be able to “obtain temporary deferral of termination of assistance for up to 18 months,” according to the fact sheet. Congress has 15 days to review the proposal. After that, HUD will release the proposal for a 60-day public comment period. The Daily Caller earlier reported the story. 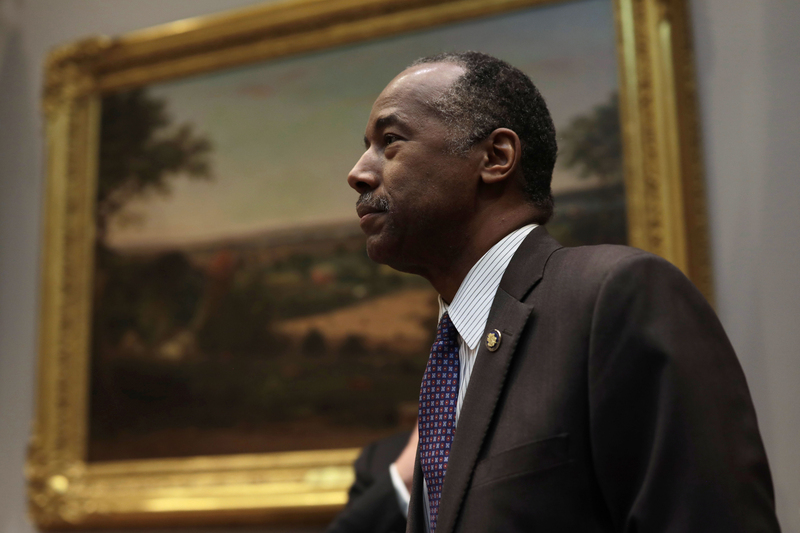 Carson gave no indication of the impending proposal in two appearances on Capitol Hill earlier this month, even when he was asked about a similar issue. House Appropriator Rep. Pete Aguilar (D-Calif.) questioned Carson about a HousingWire report that the Federal Housing Administration was denying mortgages to Deferred Action for Childhood Arrivals recipients. OLYMPIA, Wash. (AP) - An initiative that would bring back affirmative action in Washington has had a contentious hearing at the state Legislature, where advocates and critics alike questioned the role of opportunity and privilege in society. 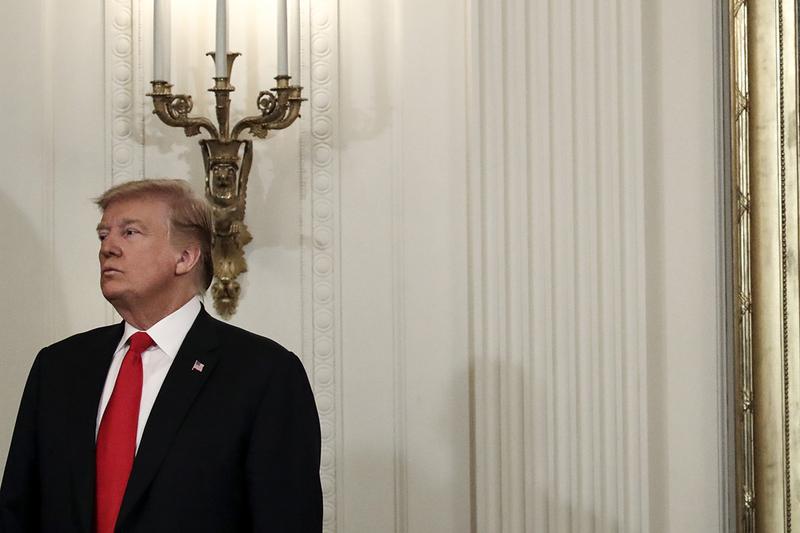 The Justice Department has released a redacted version of special counsel Robert Mueller’s report on whether Donald Trump’s campaign colluded with Russian officials and whether the president obstructed justice. You can read the PDF document below or click for a searchable version. Here’s POLITICO’s rolling analysis of the hotly anticipated document. 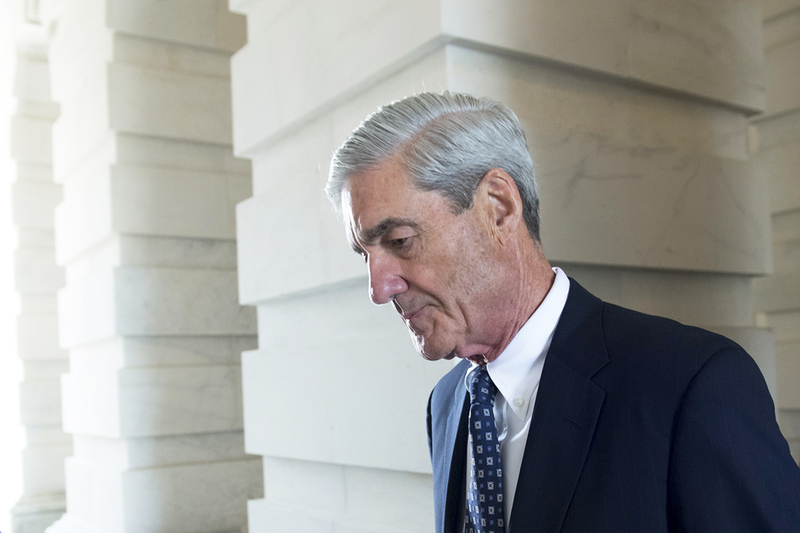 Special counsel Robert Mueller said one reason he didn't recommend bringing charges against President Trump is that it could have foreclosed Congress' ability to impeach him. How Barr's news conference compares with what Mueller wrote. White House press secretary Sarah Huckabee Sanders told investigators on special counsel Robert Mueller's team that she lied to journalists about former FBI Director James B. Comey's being unpopular within the bureau. The report says that on March 9, 2017, then-FBI Director James Comey briefed Congressional leaders and intelligence committee heads on the ongoing investigation into Russian interference. That briefing included "an identification of the principal U.S. subjects of the investigation." 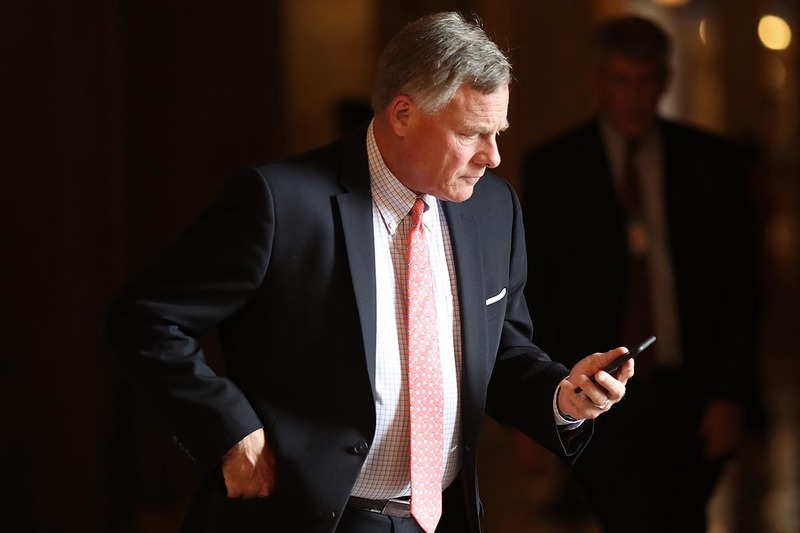 Burr (R-N.C.) then corresponded with the White House a week later about the Russia probes and the White House counsel's office "appears to have received information about the status of the FBI investigation," the special counsel report said. The Senate Intelligence probe has been widely viewed on Capitol Hill as more productive than its corresponding House investigation. There's been far less infighting and Burr has taken steps to distance himself from conflicts of interest, including skipping meetings with President Donald Trump while he's been overseeing investigations. Former House Intelligence Chairman Devin Nunes (R-Calif.), now the committee's ranking member, was seen by Democrats as far more partisan than Burr in his probes. But Burr supplying Trump's aides with information about the FBI probe could undercut some of those warm bipartisan feelings. Burr did not respond to a request for comment, nor did the Senate Intelligence Committee's ranking member, Mark Warner (D-Va.). On March 16, 2017, the special counsel's office was briefed by Burr on "4-5 targets" of the Russia probe, according to notes taken by former White House counsel Don McGahn's chief of staff, Annie Donaldson. Those targets were identified as former National Security Adviser Mike Flynn, Trump campaign Chairman Paul Manafort, campaign aide Carter Page and "Greek Guy" George Papadopoulos, who was charged with lying to the FBI, according to Donaldson's notes. Those notes say Burr said Manafort was under investigation for Ukraine and Russia dealings — not his work for the Trump campaign — and that Page was being targeted for the "$ game." McGahn and Donaldson said that they believed those people were being investigated by the Senate Intelligence Committee, but the special counsel's office was skeptical. The committee "does not formally investigate individuals as 'targets'; the notes on their face reference the FBI, the Department of Justice, and Comey; and the notes track the background materials prepared by the FBI for Comey's briefing to the Gang of 8 [congressional leaders] on March 9," the Mueller report reads. 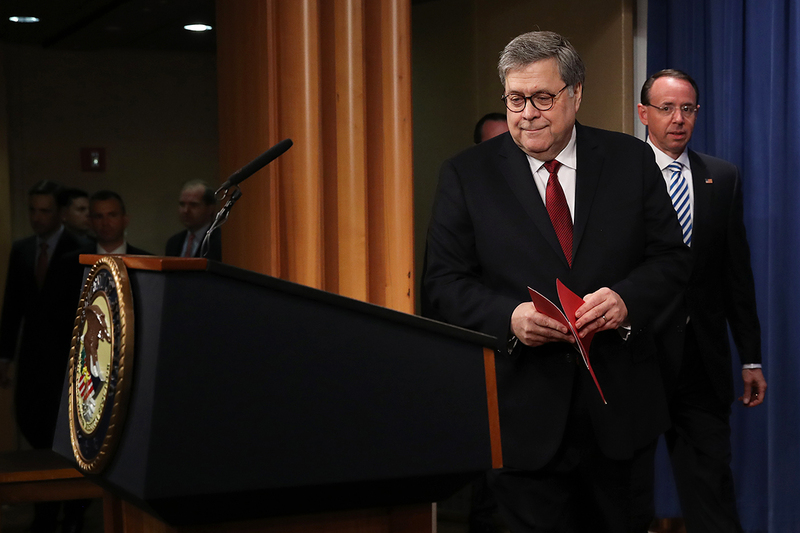 WASHINGTON (AP) - Attorney General William Barr is distorting the facts when it comes to releasing special counsel Robert Mueller's report in the Russia investigation. Top Democrats said Thursday that they do see evidence of criminal behavior by President Trump in the newly released special counsel's report — though they stopped short of suggesting impeachment. President Trump directed former White House counsel Don McGahn to remove special counsel Robert Mueller in the summer of 2017, but the attorney refused and intended to resign rather then serve as the president's hatchet man. Former Trump attorney John Dowd slammed special counsel Robert Mueller Thursday for waging a "partisan" investigation of President Trump that resulted in a "completely unnecessary" 400-page report clearing the president of collusion with Russia. JEFFERSON CITY, Mo. (AP) - The Missouri House has passed legislation that could block the developers of one of the nation's largest wind energy projects from using eminent domain to string a high-voltage power line across the Midwest. Special counsel Robert Mueller’s team considering prosecuting former Attorney General Jeff Sessions for perjury but declined, saying there was not enough evidence he knowingly gave false answers to Congress. Presidential candidate Rep. Eric Swalwell on Thursday called for the resignation of Attorney General William P. Barr, claiming his actions in regards to special counsel Robert Mueller's report have "lost the credibility of the American people." Carter Page, for a while the focus of supposed Trump-Russia election collusion, was exonerated by Robert Mueller's report on Thursday. LIMA, Peru (AP) - The suicide of former President Alan Garcia has shocked Peruvians and sparked a debate swirling Thursday on television channels and in newspaper columns: What will be the price of the country's painful reckoning with corruption? Former Attorney General Jeff Sessions was investigated for perjury by Special Counsel Robert Mueller's office for misstatements he made about contact with the Russians during his confirmation hearing, though the office concluded that it could not prove that Sessions was "willfully untruthful." 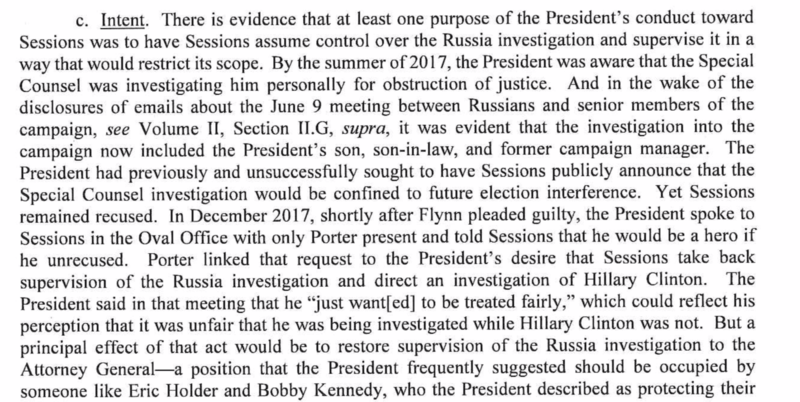 "The Office considered whether, in light of these interactions, Sessions committed perjury before, or made false statements to, Congress in connection with his confirmation as Attorney General," Mueller's report read, confirming reporting last year about Sessions' potential legal jeopardy during his confirmation hearings. Sessions told the Senate Judiciary Committee in early January 2017 that he "did not have communications with the Russians" in response to a question from then-Sen. Al Franken (D-Minn.) about his contacts with Kremlin officials. The special counsel investigation found that Sessions had interacted with Russian official at least twice and possibly a third time, all in 2016. In supplemental correspondence to the Senate Judiciary Committee, Sessions identified two campaign-era contacts with then-Russian Ambassador Sergey Kislyak but said he did "not recall any discussions" with Kislyak or other Russian officials about the presidential campaign. The special counsel's office, however, "established that Sessions interacted with Kislyak ... and that Kislyak mentioned the presidential campaign on at least one occasion." Ultimately, the office found that the "evidence is not sufficient to prove that Sessions knowingly gave false answers to Russia-related questions in light of the wording and context of those questions." The special counsel found it "plausible" that Sessions did not remember the references to the presidential campaign by Kislyak and that his statement to questions before the Judiciary Committee came in response to questions about "an alleged 'continuing exchange of information,'" the report says. "Sessions later explained to the Senate and to the [special counsel] that he understood the question as narrowly calling for disclosure of interactions with Russians that involved the exchange of campaign information, as distinguished from more routine contacts with Russian nationals. Given the context in which the question was asked, that understanding is plausible," the report found. Sessions' counsel told the media in March 2018 that the special counsel's office had concluded its perjury investigation, though Mueller's report makes clear the angle was seriously investigated. House intelligence committee Chairman Rep. Adam B. Schiff has called for special counsel Robert Mueller to testify "at the earliest opportunity" on the findings of his investigation into election meddling following the release of his redacted report. And Mitch McConnell plans to push a bill to raise the tobacco age to 21. President Trump told attorney Michael Cohen to fully cooperate with Congress, the Mueller report says, contradicting a BuzzFeed report the president ordered him to lie. "President instructed Cohen that he should cooperate because there was nothing there," the report says, quoting Mr. Cohen's interview with the FBI. 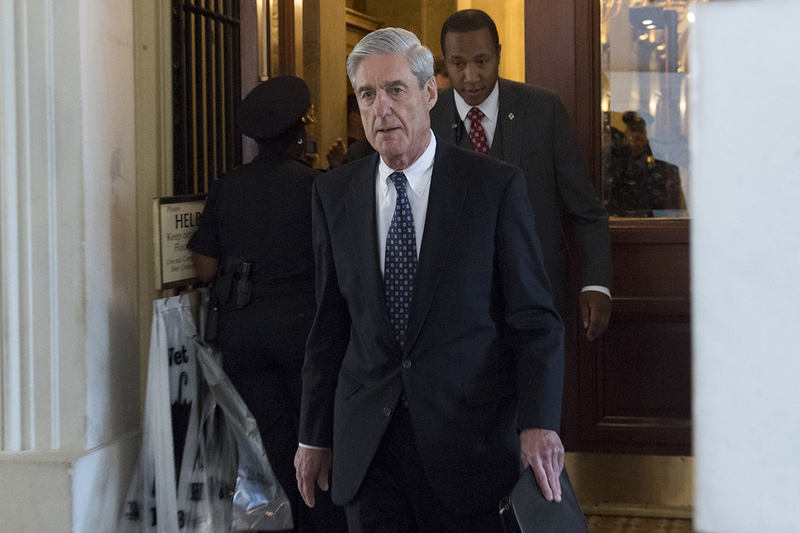 The Justice Department on Thursday released a redacted version of special counsel Robert Mueller’s report on whether Donald Trump’s campaign colluded with Russian officials and whether the president obstructed justice. While the investigation did not find hard evidence of collusion, the report detailed numerous instances in which Trump tried to interfere with the probe. We’re annotating the document in real time, pulling out the excerpts we find most interesting, and giving you the analysis you need to understand Mueller’s findings. Trump made no secret of his frustration that Sessions recused himself from overseeing the Mueller investigation — even stating publicly that he would have never appointed Sessions had he known that Sessions would recuse. Sessions said he felt a recusal was necessary due to his deep involvement with the Trump campaign as an adviser and surrogate. Trump considers new ways to intervene in the Mueller probe. Trump’s former staff secretary Rob Porter spoke with Mueller — and he revealed that Trump mused about installing other senior DOJ officials like Rachel Brand to supervise Mueller. Trump went to great lengths to encourage Sessions to investigate a political enemy: Hillary Clinton. But Sessions routinely did not commit to honoring such requests, which clearly irked the president. Mueller notes that Trump’s tweets in the following days reflected his ire. This is the top-line finding of the first volume of Mueller’s report, which focused on Russian interference in the 2016 election and potential collusion. Though the report didn’t find evidence that Trump campaign officials conspired with Russia, it notably confirms that the campaign believed Russia’s efforts would be a political boon as Trump faced off with Hillary Clinton in 2016. Trump confidante Roger Stone told the campaign about Wikileaks’ plans. The portion is redacted here to avoid “harm to ongoing matter,” which likely refers to Roger Stone’s upcoming trial. Michael Cohen testified to Congress that Stone had told Trump about an upcoming WikiLeaks release in June 2016. This is the first confirmation from Mueller that Kilimnik’s peace plan would have benefited Russia, and that the campaign continued to share polling data with Kilimnik — a suspected Russian intelligence agent — well after August 2016. A new detail about further efforts — allegedly cleared through the Russian president — to influence the incoming Trump administration through a backdoor plan, facilitated by Kushner. Dmitriev also met with Erik Prince, who had advised the campaign informally, in the Seychelles to discuss U.S.-Russia relations, according to Mueller. Trump associates boosted the Russian disinformation campaign. Mueller’s report reveals that “numerous high-profile U.S. persons” amplified fake Twitter accounts created by the Internet Research Agency, a company often dubbed a “troll farm” with close ties to the Russian government that was central to the country’s influence campaign ahead of the election. Among them: Roger Stone, Sean Hannity, Michael Flynn, Jr., and Michael McFaul and members of the Trump campaign. This at least partially resolves the Peter Smith mystery — Smith was a GOP operative who tried to solicit dark web hackers to find Clinton’s emails. Mueller says the effort was sanctioned by Trump and Flynn in July 2016, but the fact that Smith was searching for the emails around the same time that Russia was hacking the DNC seems noteworthy. This is also the first we’ve heard of Erik Prince’s involvement in the efforts to find Clinton’s emails. Bernie Sanders could defeat President Trump in the 2020 presidential election, GOP political consultant, according to former George W. Bush adviser Karl Rove. President Donald Trump responded to news of special counsel Robert Mueller's 2017 appointment by telling then-Attorney General Jeff Sessions that he was "fucked," according to a redacted version of Mueller's report released Thursday. Trump went on to lambaste his attorney general for allowing Mueller's appointment to happen, telling Sessions that the attorney general's job had been to protect him and that Sessions had "let [him] down." The president, according to Mueller's report, asked Sessions "how could you let this happen, Jeff?" The interaction was recorded in notes taken by Session’s chief of staff, Jody Hunt. Deputy Attorney General Rod Rosenstein authorized Mueller to head the investigation in May of 2017 in the wake of Trump's move to fire then-FBI Director James Comey, who had been overseeing the bureau's probe into allegations of collusion between the Trump campaign and the Kremlin. Mueller's appointment came after the president conceded that he had dismissed Comey with the Russia investigation weighing on his mind, an explanation that contradicted the White House's initial explanation of the firing. It was Rosenstein, not Sessions, who appointed Mueller because Sessions had recused himself from all Justice Department matters related to the 2016 election in the wake of revelations that he had made misleading statements to the Senate Judiciary Committee about his interactions with Russia's then-ambassador to the U.S. during the campaign. Rosenstein called Sessions to tell him about the appointment while the attorney general was with Trump in the Oval Office conducting interviews for a new FBI director, according to Mueller’s report. Sessions stepped out of the room to take the call, then delivered the news to the president, Mueller wrote in his report. Upon hearing the news, Trump slumped in his chair and lashed out at Sessions for his decision to recuse himself. Trump told Sessions that his selection as attorney general had been his most important appointment and claimed Sessions “let him down,” according to Mueller’s report. The president contrasted Sessions with former Attorneys General Eric Holder, who served under President Barack Obama, and Robert Kennedy, who served under his brother, President John F. Kennedy. Special Counsel Robert Mueller’s team found 10 instances where President Donald Trump’s conduct raised issues of possible obstruction of justice. They included Trump’s request to then-White House counsel Donald McGahn to remove Mueller from his post, evidence that Trump’s firing of FBI Director James Comey was motivated by a desire to prevent further inquiry into Russian interference in the 2016 election, and various alleged attempts to influence witnesses such as Michael Flynn and Paul Manafort. Conduct involving FBI Director Comey and Michael Flynn. In mid-January 2017, incoming National Security Adviser Michael Flynn falsely denied to the Vice President,other administration officials, and FBI agents that he had talked to Russian Ambassador Sergey Kislyak about Russia’s response to U.S. sanctions on Russia for its election interference. On January 27, the day after the President was told that Flynn had lied to the Vice President and had made similar statements to the FBI, the President invited FBI Director Comey to a private dinner at the White House and told Comey that he needed loyalty. On February 14, the day after the President requested Flynn’s resignation, the President told an outside adviser, “Now that we fired Flynn, the Russia thing is over.” The adviser disagreed and said the investigations would continue. Later that afternoon, the President clear the Oval Office to have a one-on-one meeting with Comey. Referring to the FBI’s investigation of Flynn, the President said, “I hope you can see your way clear to letting this go, to letting Flynn go. He is a good guy. I hope you can let this go,” Shortly after requesting Flynn’s resignation and speaking privately to Comey, the President sought to have Deputy National Security Adviser K.T. McFarland draft an internal letter stating that the President had not directed Flynn to discuss sanctions with Kislyak. McFarland declined because she did not know whether that was true, and a White House Counsel’s Office attorney thought that the request would look like a quid pro quo for an ambassadorship she had been offered. The President’s reaction to the continuing Russia investigation. In February 2017, Attorney General Jeff Sessions began to assess whether he had to recuse himself from campaign-related investigations because of his role in the Trump Campaign. In early March, the President told White House Counsel Donald McGahn to stop sessions from recusing. 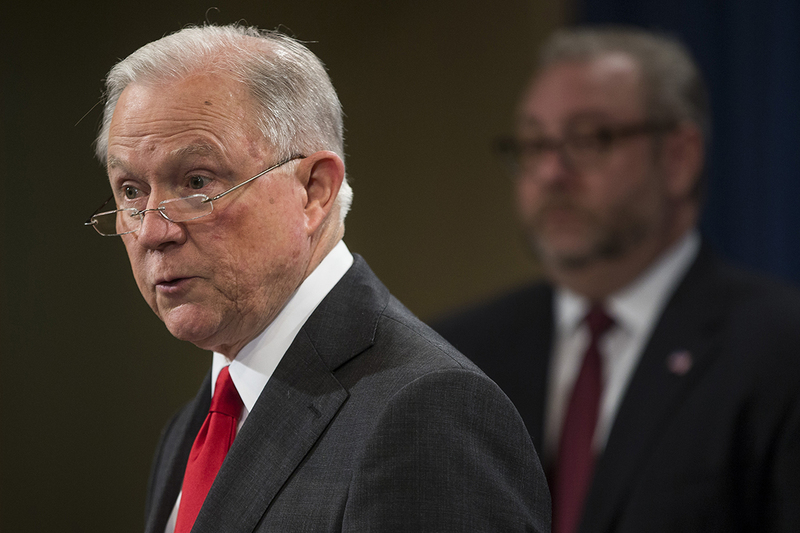 And after Sessions announced his recusal on March 2, the President expressed anger at the decision and told advisers that he should have an Attorney General who would protect him. That weekend, the President took Sessions aside at an event and urged him to “unrecuse.” Later in March, Comey publicly disclosed at a congressional hearing that the FBI was investigating “the Russian government’s efforts to interfere in the 2016 presidential election,” including any links or coordination between the Russian government and the Trump Campaign. In the following days, the President reached out to the Director of National Intelligence and the leaders of the Central Intelligence Agency (CIA) and the National Security Agency (NSA) to ask them what they could do to publicly dispel the suggestion that the President had any connection to the Russian election-interference effort. The President also twice called Comey directly, notwithstanding guidance from McGahn to avoid direct contacts with the Department of Justice. Comey had previously assured the President that the FBI was not investigating him personally, and the President ask Comey to “lift the cloud” of the Russia investigation by saying that publicly. The appointment of Special Counsel and efforts to remove him. On May 17, 22017, the Acting Attorney General for the Russia investigation appointed a Special Counsel to conduct the investigation and related matters. The President reacted to news that Special Counsel had been appointed by telling advisers that it was “the end of his presidency” and demanding that Sessions resign. Sessions submitted his resignation but the President ultimately did not accept it. The President told aides that the Special Counsel had conflicts of interest and suggested that Special Counsel therefore could not serve. The President’ advisers told him the asserted conflicts were meritless and had already been considered by the Department of Justice. On June 14, 2017, the media reported that the Special Counsel’s Office was investigating whether the President had obstructed justice. Press reports called this “a major turning point” in the investigation: while Comey had told the President he was not under investigation, following Comey’s firing, the President now was under investigation. The President reacted to his news with a series of tweets criticizing the Department of Justice and the special Counsel’s investigation. On June 17, 2107, the President called McGahn at home and directed him to call the Acting Attorney General and say that the Special Counsel had conflicts of interest and must be removed. McGahn did not carry about the direction, however, deciding that the would resign rather than trigger what he regarded as a potential Saturday Night Massacre. Efforts to prevent public disclosure of evidence. In the summer of 2017, the President learned that media outlets were asking questions about the June 9, 2016 meeting at Trump Tower between senior campaign officials, including Donald Trump Jr., and a Russian lawyer who was said to be offering damaging information about Hillary Clinton as “part of Russia and its government’s support for Mr. Trump.” On several occasions, the President directed aides not to publicly disclose the emails setting up the June 9 meeting, suggesting that the email would not leak and that the number of lawyers with access to them should be limited. Before the emails became public, the President edited a press statement from Trump Jr. by deleting a line that acknowledged that the meeting was with “an individual who [Trump Jr.] was told might have information helpful to the campaign” and instead said only that the meeting was about adoptions of Russian children. When the press asked questions about the President’s involvement in Trump Jr.’s statement, the President's personal lawyer repeatedly denied the President had played any role. Further efforts to have the Attorney General take control of the investigation. In early summer 2017, the President called Sessions at home and again asked him to reverse his recusal from the Russia investigation. Sessions did not reverse his recusal. In October 2017, the President met privately with Sessions in the Oval Office and asked him to “take [a] look” at investigating Clinton. In December 2017, shortly after Flynn pleaded guilty pursuant to a cooperation agreement, the President met with Sessions in the Oval Office and suggested, according to notes taken by a senior adviser, that if Sessions unrecused and took back supervision fo the Russia investigation, he would be a “hero.” The President told Sessions, “I’m not going to do anything or direct you to do anything. I just want to be treated fairly.” IN response, Sessions volunteered that he had never seen anything “improper” on the campaign and told the President there was a “whole new leadership team” in place. He did not unrecuse. Efforts to have McGahn deny that the President had ordered him to have the Special Counsel removed. In early 2018, the press reported that the President had directed MCGahn to have the Special Counsel removed in June 2017 and that McGahn had threatened to resign rather than carry out the order. The President reacted to the news stories by directed WHite House officials to tell McGahn to dispute the story and create a record stating he had not been ordered to have the Special Counsel removed. McGahn told those officials that the media reports were accurate in stating that the President had directed McGahn to have the Special Counsel removed. The President then met with McGahn in the Oval Office and again pressured him to deny the reports. In The same meeting, the President also asked McGahn why he had told the Special Counsel about the President’s efforts to remove the Special Counsel and why McGahn took notes of his conversations with the President. McGahn refused to back away from what he remembered happening and perceived the President to be testing his mettle. agreement with the President and began cooperating with the government, the President's personal counsel left a message for Flynn 's attorneys reminding them of the President 's warm feelings towards Flynn, which he said "still remains," and asking for a "heads up" if Flynn knew "information that implicates the President." When Flynn 's counsel reiterated that Flynn could no longer share information pursuant to a joint defense agreement, the President's personal counsel said he would make sure that the President knew that Flynn's actions reflected "hostility" towards the President. During Manafort 's prosecution and when the jury in his criminal trial was deliberating, the President praised Manafort in public, said that Manafort was being treated unfairly, and declined to rule out a pardon. After Manafort was convicted, the President called Manafort "a brave man" for refusing to "break" and said that "flipping" "almost ought to be outlawed. [Harm to Ongoing Matter]. former Trump Organization executive, changed from praise for Cohen when he falsely minimized the President's involvement in the Trump Tower Moscow project, to castigation of Cohen when he became a cooperating witness. From September 2015 to June 2016, Cohen had pursued the Trump Tower Moscow project on behalf of the Trump Organization and had briefed candidate Trump on the project numerous times, including discussing whether Trump should travel to Russia to advance the deal. In 2017, Cohen provided false testimony to Congress about the project, including stating that he had only briefed Trump on the project three times and never discussed travel to Russia with him, in an effort to adhere to a "party line" that Cohen said was developed to minimize the President's connections to Russia. While preparing for his congressional testimony. Cohen had extensive discussions with the President's personal counsel, who, according to Cohen, said that Cohen should "stay on message" and not contradict the President. After the FBI searched Cohen's home and office in April 2018, the President publicly asserted that Cohen would not "flip," contacted him directly to tell him to "stay strong," and privately passed messages of support to him. Cohen also discussed pardons with the President's personal counsel and believed that if he stayed on message he would be taken care of. But after Cohen began cooperating with the government in the summer of 2018, the President publicly criticized him, called him a "rat," and suggested that his family members had committed crimes. Several features of the conduct we investigated distinguish it from typical obstruction-of-justice cases. First, the investigation concerned the President, and some of his actions, such as firing the FBI director, involved facially lawful acts within his Article II authority, which raises constitutional issues discussed below. At the same time, the President’s position as the head of the Executive Branch provided him with unique and powerful means of influencing official proceedings, subordinate officers, and potential witnesses – all of which is relevant to potential obstruction-of-justice analysis. Second, unlike cases in which a subject engages in obstruction of justice to cover up a crime, the evidence we obtained did not establish that the President was involved in an underlying crime related to Russian interference. Although the obstruction statutes do not require proof of such a crime, the absence of that evidence affects the analysis of the President’s intent and requires consideration of other possible motives for his conduct. Third, many of the President’s acts directed at witnesses, including discouragement of cooperation with the government and suggestions of possible future pardons, took place in public view. That circumstance is unusual, but no principle of law excludes public acts from the reach of obstruction laws. If the likely effect of public acts is to influence witnesses or alter their testimony, the harm to the justice system’s integrity is the same. Statutory defenses. Consistent with precedent and the Department of Justice’s general approach to interpreting obstruction statutes, we concluded that several statutes could apply here. [list of statutory sections] Section 1512(c)(2) is an omnibus obstruction-of-justice provision that covers a range of obstructive acts directed at pending or contemplated official proceedings. No principle of statutory construction justifies narrowing the provision to cover only conduct that impairs the integrity or availability of evidence. Sections 1503 and 1505 also offer broad protection against obstructive acts directed at pending grand jury, judicial, administrative, and congressional proceedings, and they are supplemented by a provision in Section 1512(b) aimed specifically at conducted intended to prevent or hinder the communication to law enforcement of information related to a federal crime. Constitutional defenses. As for constitutional defenses arising from the President’s status as head of the Executive Branch, we recognized that the Department of Justice and the courts have not definitively resolved these issues. We therefore examined those issues through the framework established by Supreme Court precedent governing separation-of-powers issues. The Department of Justice and the President’s personal counsel have recognized that the President is subject to statutes that prohibit obstruction of justice by bribing a witness or suborning perjury because the conduct does not implicate his constitutional authority. With respect to whether the President can be found to have obstructed justice by exercising his powers under Article II of the Constitution, we concluded that Congress has authority to prohibit a President’s corrupt use of his authority in order to protect the integrity of the administration of justice. Under applicable Supreme Court precedent, the Constitution does not categorically and permanently immunize a President for obstructing justice through the use of his Article II powers . The separation-of-powers doctrine authorizes Congress to protect official proceedings, including those of courts and grand juries, from corrupt, obstructive acts regardless of their source. We also concluded that any inroad on presidential authority that would occur from prohibiting corrupt acts does not undermine the President's ability to fulfill his constitutional mission. The term "corruptly " sets a demanding standard. It requires a concrete showing that a person acted with an intent to obtain an improper advantage for himself or someone else, inconsistent with official duty and the rights of others. A preclusion of "corrupt" official action does not diminish the President's ability to exercise Article II powers. For example, the proper supervision of criminal law does not demand freedom for the President to act with a corrupt intention of shielding himself from criminal punishment, avoiding financial liability, or preventing personal embarrassment. To the contrary, a statute that prohibits official action undertaken for such corrupt purposes furthers, rather than hinders, the impartial and even handed administration of the law. It also aligns with the President's constitutional duty to faithfully execute the laws. Finally, we concluded that in the rare case in which a criminal investigation of the President's conduct is justified, inquiries to determine whether the President acted for a corrupt motive should not impermissibly chill his performance of his constitutionally assigned duties. The conclusion that Congress may apply the obstruction laws to the President 's corrupt exercise of the powers of office accords with our constitutional system of checks and balances and the principle that no person is above the law. 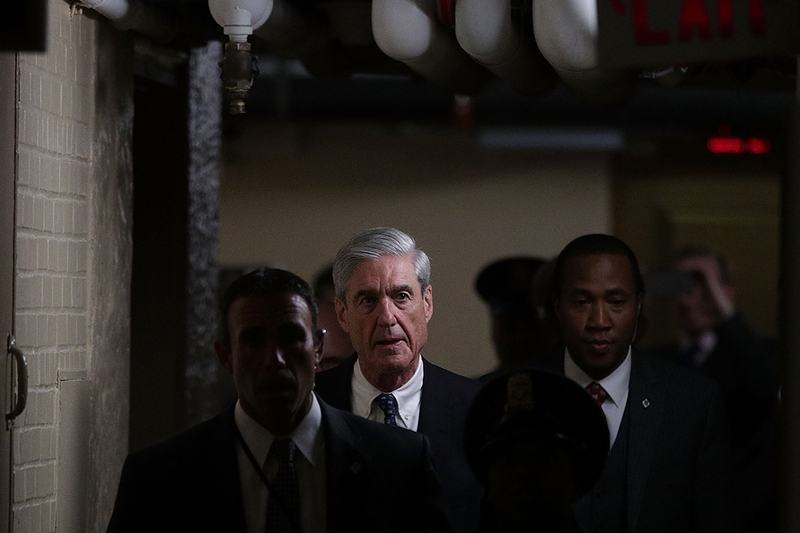 Special counsel Robert Mueller’s long-awaited report hammered home a crucial reminder Thursday: The Kremlin mounted a massive online campaign to wreak havoc on U.S. democracy in 2016. It also underscored the urgency of fixing the nation’s election security gaps before 2020 — a task that state and local governments have been slow to take on. "The Russian government interfered in the 2016 presidential election in sweeping and systematic fashion," Mueller wrote in the 448-page document, which lays out new details about a Kremlin-backed plot that compromised Democrats' computer networks and targeted state and local election offices. Mueller wrote that investigators also found evidence of repeated communications — but not "coordination" — between associates of then-candidate Donald Trump and people claiming to have damaging information on Hillary Clinton. "Although the investigation established that the Russian government perceived it would benefit from a Trump presidency and worked to secure that outcome, and that the Campaign expected it would benefit electorally from information stolen and released through Russian efforts, the investigation did not establish that members of the Trump Campaign conspired or coordinated with the Russian government in its election interference activities," Mueller wrote. The report discloses that the FBI believes Russian hackers succeeded in breaching "at least one” Florida county government by sending malicious emails to local election officials, although Mueller’s team “did not independent verify that belief." That detail echoes a cryptic statement last August from then-Democratic Florida Sen. Bill Nelson, who faced criticism for saying, without evidence, that Russians had accessed his state’s voter data. Investigators found that Russian hackers compromised 29 computers at the DCCC and stole more than 70 gigabytes of files from the group’s shared file server. They also hacked more than 30 Democratic National Committee computers in less than two months and stole approximately 300 gigabytes from a DNC cloud-based service. The report says one attack — the first attempt by Russia's military intelligence service to compromise Clinton's personal office — came within about five hours of Trump publicly asking "Russia, if you're listening," to find 30,000 emails that had been deleted from the former secretary of state's infamous personal email server. Most of the evidence of the Kremlin's efforts has already surfaced in the indictments Mueller secured against Russian hackers and social media trolls. Those charges, which accused a total of 25 Russian operatives of hacking Democratic Party targets and spreading inflammatory posts on social media, laid out the simple strategy and low-cost techniques that prosecutors said helped Moscow undermine and distract the Clinton campaign. The remarkably detailed indictments fueled calls for more secure election systems and more diligent scrutiny by social media of fake news and trolling in their sites. They also bolstered warnings from top Trump administration officials that Russia and other nations will do anything they can to destabilize U.S. politics — even as Trump himself has sometimes sown doubts that Vladimir Putin's regime was to blame. In July 2018, Mueller brought an indictment against 12 Russian military officers on charges of hacking the DNC and the DCCC, adding weight to the conclusion that Moscow was behind the cyberattacks that rocked the 2016 campaign. Plenty of evidence already supported that conclusion, including reports from private cybersecurity companies that investigated the breach and quickly linked it to the Russian military-linked hacker groups nicknamed Fancy Bear and Cozy Bear. Independent experts also found clues linking the attacks to Russia. So did the United States’ top intelligence agencies in a report issued weeks before Trump took office. But Mueller’s indictment was the product of the vast investigative resources of the Justice Department and the FBI, which were able to unmask the individual hackers who infiltrated the party committees, construct a timeline of their activities and obtain their search histories to show how they prepared for the attacks. The document brought clarity to a previously hazy timeline of what the Russians did and when. Some of its revelations seemed tailor-made for the briefings that cybersecurity experts were giving campaign staffers and candidates in the lead-up to the 2018 midterm elections. For example, by describing how the Russians used their access to the DCCC’s network to penetrate the DNC, the indictment emphasized the need for campaigns and political groups to monitor how third parties can access their systems. Nation-state hackers are increasingly targeting third-party vendors to piggyback on their access to the hackers’ real targets. The report reveals that the hackers tunneled into the DNC's computers through a so-called virtual private network, a service intended to provide secure access to the DNC's network for trusted DCCC employees. The indictment also offered further evidence that the hackers were going after state election offices that until recently devoted almost no energy to cybersecurity. It confirmed media reports that the Russians had stolen voter data from Illinois’ election board and, in another example of third-party risk, breached an election vendor in Florida as a way of targeting its customers. The specificity of the narrative offered a wakeup call to election officials and campaigns — although leaders in some states are still hitting the snooze button. In the months since, major tech companies have repeatedly announced takedowns of fake accounts associated with foreign governments, although they have also faced criticism that they’re doing too little. Facebook rolled out a series of changes aimed at addressing the threat, including verifying political advertisers, launching an ad transparency center, using both artificial intelligence and human reviewers to detect and block fake accounts, working with third-party fact checkers to vet disinformation and setting up a “war room” meant to respond to malicious activity in real time. Google subsidiary YouTube began labeling videos uploaded by state-funded media outlets including RT — formerly Russia Today — and tweaked its algorithms in a bid to stop the spread of conspiracy theories. And Twitter, which launched its own ad transparency center, ramped up its efforts to pull fraudulent accounts and prevent the people behind them from starting new ones. It also banned the spread of hacked materials like the stolen Democratic emails that went viral shortly before the 2016 election. Ben Buchanan, a Georgetown University professor whose research covers cyber statecraft and election security, said the Mueller probe offered “unique insight” into, and “rock solid evidence” of, Russian operations. “No other single source comes close to its granularity and level on detail about how the Russians went about their mission,” he said. Beyond the two indictments, the news tsunami of the Mueller investigation ensured that election officials, lawmakers, federal agencies and tech companies were constantly facing questions about the 2016 interference and the cybersecurity issues it raised. State and local election officials began vowing an increased focus on cybersecurity. DHS stepped up its coordination with these officials, conducting scans and assessments to identify weak points in states’ networks. Congress gave the states $380 million to buy new voting machines, hire cyber experts, conduct audits and shore up voter registration databases. And companies like Microsoft and Cloudflare began offering free security tools to campaigns and election offices. “For elections officials across the country, the Mueller investigation and indictments have heightened our need for additional resources to defend against cyber attacks,” California Secretary of State Alex Padilla told POLITICO. But the interest in election security as a result of the Mueller probe has also exposed how much work remains to be done. 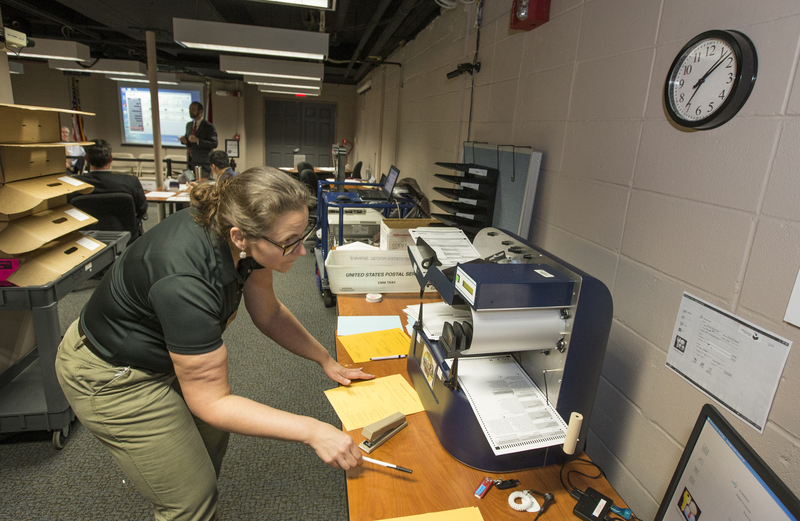 States have moved slowly to spend their federal grant money, because buying new technology takes time and officials face a crush of other tasks — the money arrived just as officials prepared to hold their midterm primaries. Some states, including Georgia, have chosen to replace their voting machines with devices that experts call insecure. In Washington, bureaucratic issues like a lack of security clearances and insufficient planning have hampered federal agencies’ effectiveness. On the Hill, lawmakers have deadlocked over proposals to set new voting security requirements. And the powerful companies that make voting equipment have resisted efforts to make them more transparent and accountable. Mueller’s investigation may be over, and its redacted conclusions available for public viewing, but it will be years before government and corporate cyber defenders have fixed the vulnerabilities that his probe thrust into the national conversation. Tim Starks and Nancy Scola contributed to this report. Here are the key sections and the over-arching lessons. Michael Flynn told the Mueller investigation that Trump “made this request repeatedly” and Flynn reached out to a Republican operative and GOP Senate staffer. President Trump directed his communications team three separate times to mislead the public over the reasons for the June 2016 Trump Tower meeting with a Russian attorney who promised dirt on Hillary Clinton. NASHVILLE, Tenn. (AP) - Tennessee troopers arrested five protesters at the state Capitol after a 30-hour long sit-in outside Gov. Bill Lee's office. The FBI believes that Russian hackers were able to breach “at least one” Florida county government through a spearphishing campaign targeting local election officials, according to special counsel Robert Mueller’s report. Mueller’s team “did not independent verify that belief,” the report said, because DHS and the FBI were already investigating the attempted intrusions into election offices and voting technology companies. Last August, then-Florida Sen. Bill Nelson faced criticism for saying cryptically that the Russians had accessed his state’s voter data. The Russian hackers sent spearphishing emails to more than 120 email accounts operated by Florida county election officials, according to the redacted report. The report offers specific figures for several previously revealed elements of the hacking campaign. For example, the Russian hackers compromised 29 different computers at the Democratic Congressional Campaign Committee and stole more than 70 gigabytes of files from the group’s shared file server. The hackers also hacked more than 30 Democratic National Committee computers in less than two months, including the committee’s mail server and file server. And they stole approximately 300 gigabytes from a DNC cloud-based service. And while Mueller’s indictment of 12 Russian hackers previously revealed that they accessed the DNC by pivoting from the DCCC, the report reveals that they did so through a virtual private network, or VPN, connection, set up so that DCCC employees could access DNC resources. Senate Majority Leader Mitch McConnell said Thursday he plans to introduce a bill that raises the nationwide minimum age for purchasing tobacco or vaping products from 18 to 21, saying nicotine use has reached "epidemic levels." Reports of compromising video footage of President Trump engaged with prostitutes in a Moscow hotel were "fake," according to special counsel Robert Mueller's report. 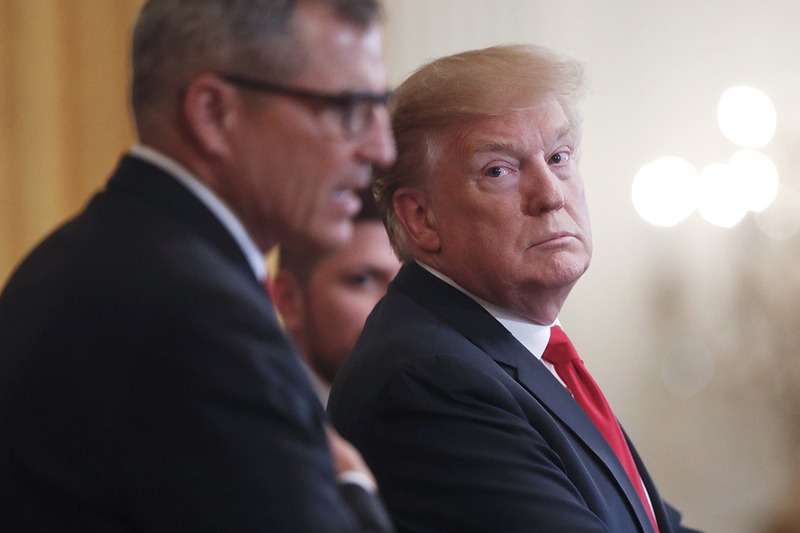 President Donald Trump claimed victory and cast himself as exonerated by special counsel Robert Mueller’s Russia probe at a veterans’ event at the White House on Thursday, speaking within minutes of Mueller’s full report posting online. As Washington officials and people around the world scoured the roughly 400-page document, Trump, projecting a breezy business-as-usual demeanor, told an East Room crowd that was having a “good day” because the report showed “no collusion” and “no obstruction,” two claims he has made for months. In very brief remarks about the Russia scandal before he moved onto the subject at hand, an event honoring “wounded warrior” veterans, Trump turned the spotlight back on his accusers and investigators. The president arrived 30 minutes late to the event, so that his arrival ended up coinciding with the release of the special counsel’s report. Even as he spoke, countless people were downloading and scouring the Justice Department document, some two years in the making, which is packed with evidence of behavior by Trump and his associates that Mueller did not conclude was clearly criminal but are already drawing howls of outrage from Democrats. A White House spokesperson did not respond to a request for comment on the president’s tardiness, or inquiries about whether he’d watched Attorney General Bill Barr’s press conference about the report before its release, which was widely panned by Democrats as being overly generous to the president. Within minutes of Barr wrapping up his press conference and before he appeared at the White House, Trump boastfully claimed victory, tweeting an image of himself surrounded by smoke with the words, “No Obstruction. No Collusion. For the haters and the radical left Democrats...GAME OVER,” with a design that recalls the HBO series “Game of Thrones.” Trump subsequently pinned the tweet to the top of his Twitter timeline. 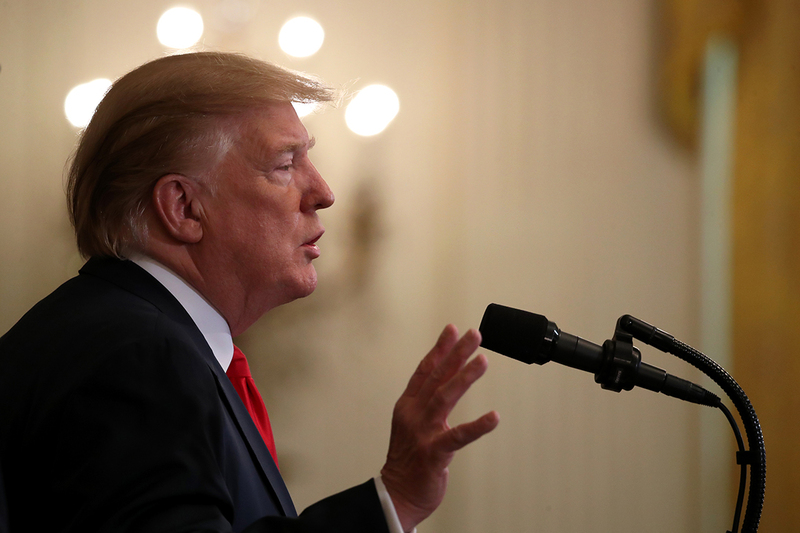 Earlier Thursday, Trump had promoted Barr’s press conference, instructing his followers to watch it on Fox News or the pro-Trump One America News Network. “No Collusion - No Obstruction!” he added in another tweet, linking to a video celebrating Mueller’s finding that his campaign did not collude with Russia. The release of the full report had been a subject of anxiety in the West Wing in recent weeks, but the president’s fears might have been eased this week when lawyers from the White House and Trump’s personal legal team were given a chance to read the redacted report. Barr told reporters Thursday that the White House did not request any additional redactions of the report. Still, the substance of the report could prove damaging for people in Trump’s orbit, including current and former Trump officials worried they could face the president’s wrath for disclosing intimate details of campaign and White House activities. HELENA, Mont. (AP) - Montana's Medicaid expansion program is one state House vote away from continuing for another six years. The House voted 87-13 Thursday to accept the Senate's amendments to the bill that would keep alive the program that provides health care for about 96,000 low-income Montanans. NEW YORK (AP) - Somewhere in the shadows of federal bureaucracy, there was an issue about the drinking habits of Augusto Pinochet. Republicans have one message following the conclusion of Robert Mueller’s probe: Move on. With no criminal charges against the president, GOP lawmakers on Thursday gleefully watched Attorney General William Barr repeat their oft-repeated lines of “no collusion” to a national audience. Even before the formal release of Mueller’s 400-page report — which contained damaging information about President Donald Trump — congressional Republicans celebrated the end a nearly two-year investigation that has hung like a dark cloud over Trump’s presidency. And they’re ready to turn it into the first day of their 2020 election. Trump was particularly upbeat at the White House Thursday. “I’m having a good day, too. It’s called, no collusion, no obstruction,” Trump said at a veterans event. Meadows, like Trump and other Republicans, said the issue now is why the Mueller investigation began in the first place. After months of echoing Trump’s cries of a “witch hunt” and a conspiracy, top Republicans feel the White House has finally been cleared — and that their allegiance to the president has paid off. Senate Republicans were more cautious about the report’s conclusions, though they heaped praise on Barr’s handling of the matter. “I applaud Attorney General Barr for his commitment to transparency and keeping the American people informed, consistent with the law and our national security interests,” said Senate Judiciary Chairman Lindsey Graham (R-S.C.), who said his committee is reviewing the report. Democrats, meanwhile, made clear Thursday they had no plans to quietly walk away from Mueller’s findings, which identified 10 instances where Trump may have obstructed justice. 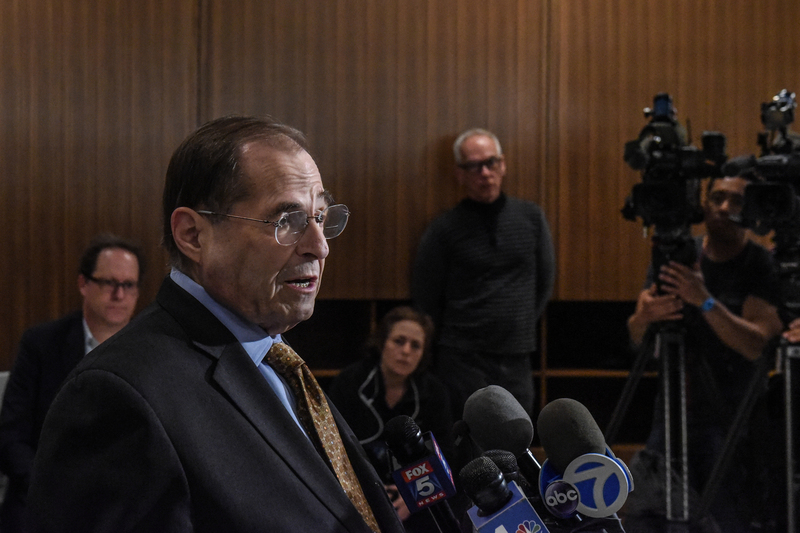 House Judiciary Committee Chairman Jerry Nadler (D-N.Y.) formally announced Thursday that he plans to bring in Mueller to testify, with plans to hear from Barr, as well — a series of high-profile hearings that will once again consume Washington and force the GOP to go on the defense. Republicans plan to rebuff Democratic cries of a conspiracy or cover up by noting Barr said that the White House did not assert executive privilege over the report, while Mueller assisted with the redactions. “No cover up when there’s nothing to cover up,” Rep. Doug Collins (Ga.), the top Republican on the House Judiciary Committee, wrote on Twitter. Collins also pointed out that no one outside of the Department of Justice viewed the unredacted report. Trump’s personal lawyers did read a final version of the redacted report before it was publicly released, which Barr said was “consistent with the practice” under current law. "No collusion! No obstruction! Complete cooperation from the President. No executive privilege asserted," Rep. Jim Jordan, the top Republican on House Oversight Committee, wrote on Twitter. Another GOP lawmaker, Rep. Andy Harris (R-Md. ), said Thursday that “it’s time we move on" after two years of "wasted time, energy and $25 million." The GOP is also seizing on the fact that not a single American — let alone a member of Trump’s campaign — was involved in conspiracy with Russia to interfere in the 2016 election, according to Barr. Yet Trump, his family and his aides will still face months of investigations from multiple panels in the Democratic House. The 10 potential areas of obstruction of justice, which are expected to be laid out in detail in the report, are likely to be seen by Democrats as a critical area for further investigation. In his public remarks on Thursday, Barr said “there was no evidence of Trump campaign ‘collusion’ with the Russian government’s hacking.” And he noted that he “disagreed with some of the Special Counsel’s legal theories” involving obstruction of justice — raising further questions about whether he was looking to protect Trump. Still, Republicans see Thursday as a significant turning point for Trump’s presidency. In fact, some of them are feeling so confident that they are ready to turn the tables on Democrats and deepen their own probes into what they believe to be illegal surveillance tactics by the FBI. INDIANAPOLIS (AP) - The leader of the Indiana House is skipping votes on a major gambling-related bill after a casino owner helped arranged a local government contract with his law firm. President Trump boasted that he's "having a good day" Thursday as the Mueller report was finally released, exonerating him of colluding with Russia and obstructing justice. When Robert Mueller was appointed in 2017 to probe President Trump, the president saw it as a catastrophe of colossal proportions, saying it marked "the end of my presidency," according to the special counsel's final report. LITTLE ROCK, Ark. (AP) - Census data shows that Arkansas' sustained population growth in 2018 was bolstered more by people migrating to the state than residents giving birth. President Trump was joking when he publicly begged WikiLeaks to find Hillary Clinton's emails, and doesn't recall ever being told that associates of his were talking with WikiLeaks, the president told the special counsel's investigation probing the 2016 election. 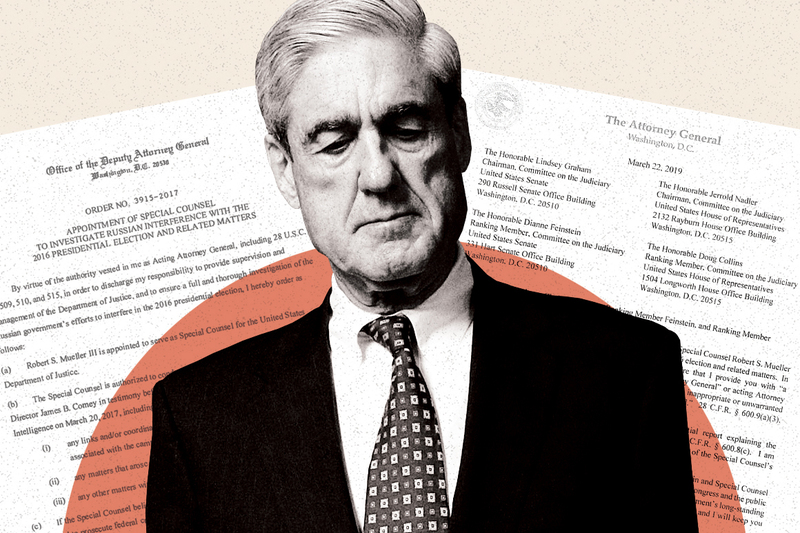 The Justice Department has released a redacted version of special counsel Robert Mueller’s report on his Russia probe, marking a watershed moment in Donald Trump’s presidency. The 381-page report is the culmination of a nearly two-year-long investigation that has cast a shadow over Trump’s time in office as questions swirled around whether Trump’s campaign conspired with Moscow intermediaries to sway the 2016 election, and whether the president tried to impede an investigation into the matter. While the exhaustive document confirms that Mueller found no conspiracy between Trump’s campaign and the Kremlin, it contains some unfavorable observations regarding potential obstruction of justice. “If we had confidence after a thorough investigation of the facts that the President clearly did not commit obstruction of justice, we would so state. Based on the facts and the applicable legal standards, however, we are unable to reach that judgment,” the report says in a 182-page section dedicated to obstruction. “Accordingly, while this report does not conclude that the President committed a crime, it also does not exonerate him,” it continues. The passage is particularly notable as it contains the full context of a line that Attorney General William Barr used in an initial March 24 letter he released summarizing the principal conclusions of Mueller’s report. Barr chose only to include a portion of the final sentence, frustrating Democrats, some former DOJ officials and even some on Mueller’s team, who felt that the selective editing narrowly presented the special counsel’s findings. Barr also proactively announced in his March letter that he would not bring an obstruction case against the president, further irritating Democrats. Mueller’s report leaves open the possibility that Trump could at least in theory face prosecution for criminal acts after he leaves office. Mueller’s prosecutors decided, therefore, that a criminal investigation of the president was appropriate. However, Mueller’s team said making a decision about whether crimes were committed would have gone too far. Long-standing DOJ legal guidance dating to Watergate says a sitting president can’t be indicted. “Fairness concerns counseled against potentially reaching that judgment when no charges can be brought,” the report says. Mueller’s report also addresses a major question that has lingered since the public got the first glimpses of his findings in late March — why the special counsel’s team didn’t push for an interview with the president. The question took on greater importance Thursday morning, when Barr emphasized at a news conference that he believed Trump’s intent was critical to determining whether the president was trying to stymie the Russia probe with his actions, including firing FBI Director James Comey and relentlessly attacking Mueller and his team as corrupt. “We also sought a voluntary interview with the President. After more than a year of discussion, the President declined to be interviewed,” Mueller’s team wrote. Just after that statement, however, a portion of the report was redacted on grand jury secrecy grounds. Trump ultimately agreed to answer written questions on Russia topics, but declined to answer questions about “obstruction topics” or about the transition period. Mueller’s team also felt it had “sufficient evidence to understand relevant events and to make certain assessments without the President’s testimony,” according to the report. Redactions such as the one blocking details about Mueller’s attempts to interview Trump are likely to become the next battleground between Democrats and Barr. Democrats have said that the attorney general — a recent Trump appointee who raised eyebrows with his decision to reveal two of Mueller’s most high-profile conclusions weeks before the report could be made public — can’t be trusted to oversee a fair redaction process. Democratic House leaders have already threatened to issue a subpoena to Barr, and they’re planning follow-up legal action to obtain the unredacted document. Briefing reporters Wednesday ahead of the Mueller report’s release, a senior DOJ official said that a less-redacted version of the Mueller report will eventually be shared with select members of Congress and their aides. The report will inevitably guide congressional Democrats for the next two years as they investigate Trump and his inner circle for a potpourri of potential malfeasance, from financial fraud to security clearance abuses. A senior Democratic aide recently told POLITICO that the six House committees conducting Trump-related investigations will immediately determine which revelations in the report apply to which panel and where there might be overlap as lawmakers move forward. As for the inchoate 2020 presidential campaign, the report has the potential to shape the candidates’ early talking points. Democratic presidential hopefuls have mostly skirted the subject to this point, deferring to Mueller’s findings. But with those findings finally coming out, candidates will be forced to confront politically prickly questions about whether Congress should launch impeachment proceedings against the president. For Trump, the report — regardless of its contents — will offer yet another chance to trumpet his well-worn narrative that the true corruption was among the officials who launched and led the Russia probe. Indeed, since Barr cracked the window on Mueller’s conclusions, Trump has been testing a vengeance campaign that he’ll likely deploy for 2020 — “investigate the investigators,” decry the “attempted coup” and call for the resignation of his main Democratic foils in Congress. Washington will also be watching to see whether Trump moves to pardon or commute the prison sentences of any allies entangled in the probe. While the president has dismissed questions about clemency, he’s pointedly not ruled it out, either. While Mueller’s work is completed, Trump still faces multiple investigations into his campaign, his presidency and his private business from congressional investigators and other authorities. The special counsel has spun off elements of his probe to other DOJ offices, including tips to New York prosecutors that led to the Cohen charges and possibly informed a broad swath of subpoenas federal prosecutors sent to Trump’s inaugural committee. Republicans and Democrats both seem confident in their positions. The Justice Department established a baseline for "collusion" that matches what Trump wants to see. NEW HAVEN, Conn. (AP) - A Connecticut teenager has pleaded guilty to illegally manufacturing guns that he then sold to an undercover federal agent. Mohammadreza Kamali pleaded guilty Tuesday in a New Haven federal court to dealing firearms without a license. BOULDER, Colo. (AP) - The lone finalist in the University of Colorado system presidential search is facing backlash for recent comments he made related to affirmative action. Several of the 2020 Democratic presidential candidates panned Attorney General Robert Barr's released the finding special counsel Robert Mueller's probe, saying they refuse to accept the "spin" coming from the Trump administration. “Mr. Barr is acting today as the President's personal attorney rather than as the highest-ranking law enforcement official in the nation,” added Rep. Mike Quigley (D-Ill.), a member of the House Intelligence Committee. In his statement to reporters, Barr was adamant in his defense of Trump, saying the president faced an “unprecedented situation” and acted with the “sincere belief” that Mueller’s probe was undermining his presidency. “Criminal acts are still criminal even if you're ‘frustrated’ when you commit them,” Rep. Val Demings (D-Fla.), another Judiciary member and former police chief, tweeted in response. Barr will testify before the House Judiciary panel on May 2, a day after he is scheduled to appear before the Senate Judiciary Committee. Even before Barr and Deputy Attorney General Rod Rosenstein held the Thursday morning press conference, Democrats were blasting the move as a partisan attempt to spin the report in the best light and protect the president. Republicans, meanwhile, celebrated the formal conclusion of the nearly two-year investigation into the White House. They argue that Mueller has cleared Trump of any claims of wrongdoing — before they’ve seen the full report and even as Barr acknowledged 10 instances of potential obstruction of justice by the president. 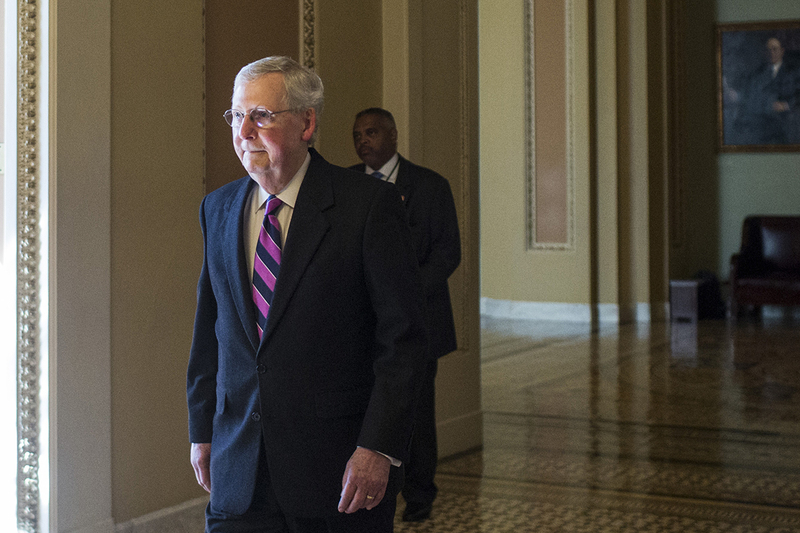 Mitch McConnell will introduce legislation to raise the legal age to buy tobacco from 18 to 21, calling it a “top priority” when the Senate returns from recess in late April. The Senate majority leader’s move comes one day after he announced his reelection campaign and shows the changing politics of tobacco. 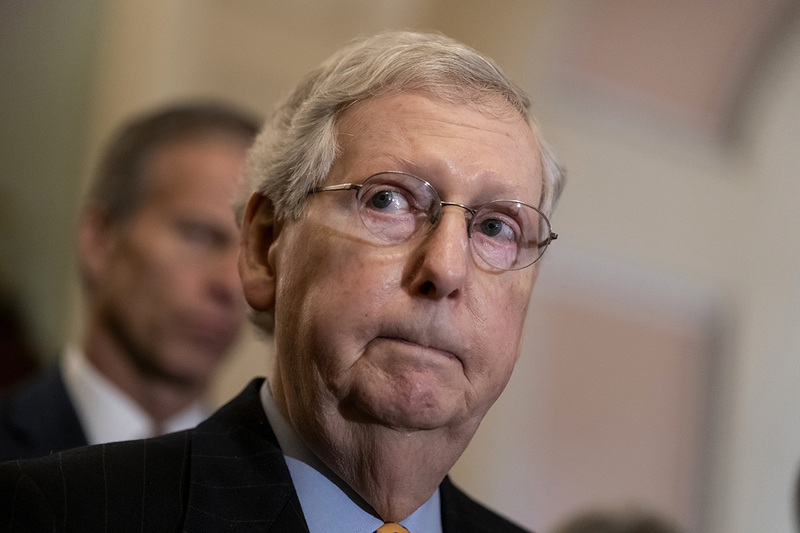 While tobacco has long been a key industry in his home state of Kentucky, McConnell said he wants to change the law to discourage vaping, teenage nicotine addiction and to improve Kentucky’s public health. “I hope and expect this legislation to get strong bipartisan support in the Senate. As you know, I’m in a particularly good position to enact legislation and this will be a top priority,” McConnell said. The GOP leader also said that there will be an exception for members of the military. President Trump had a reason to be angry at the prevailing narrative that he colluded with Russia and with the subsequent 22-month special counsel's investigation, Attorney General William Barr said Thursday.